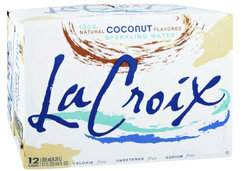 La Croix Coconut Flavored Sparkling Water. A new twist on refreshing. 100% Natural Sparkling Water combined with the flavor of Coconut makes this an amazing beverage. There no calories just great taste. Coconut La Croix Sparkling Water comes in a 12 Count Case.